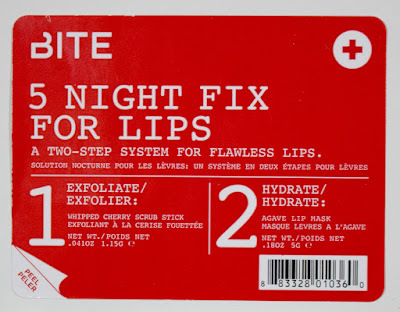 The Bite Beauty 5 Night Fix for Lips retails for $15US and $18CAN, it's not in stock online right now but I still see a ton of these in store up here in Canada (but it's not being shipped to Canada anymore either >_<). 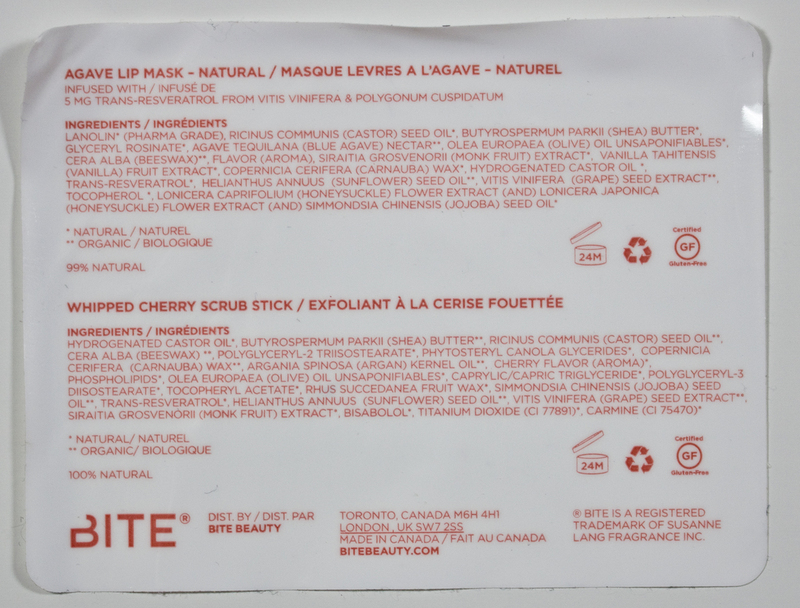 The reason I'm still reviewing it, is because it contain the Bite Beauty Agave Lip Mask and Lip Scrub in Whipped Cherry (just in a tube form). This set of minis I've been working through since end of June 2015... and it's still going! 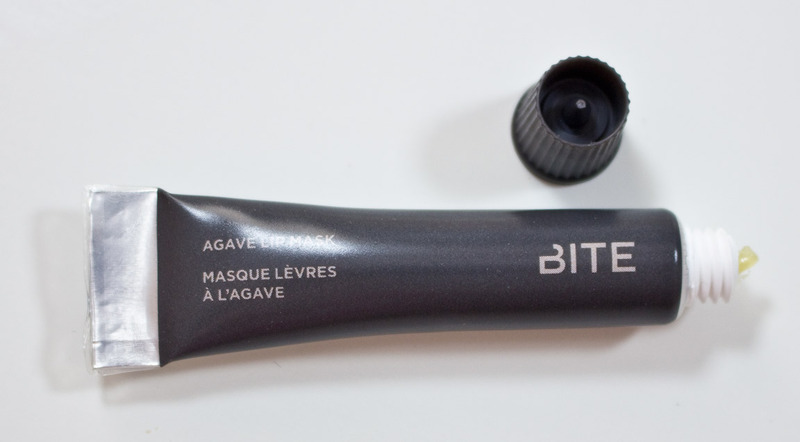 The Bite Beauty Agave Lip Mask retails for $26US or $30CAN for 0.52 oz of product at full size. The Bite Beauty Whipped Cherry Lip Scrub retails for $18US and $21CAN for 0.26 oz of product at full size. Bite Beauty Agave Lip Mask; product is a yellow tone to spreads out clear. Bite Beauty 5 Night Fix for Lips jar label. 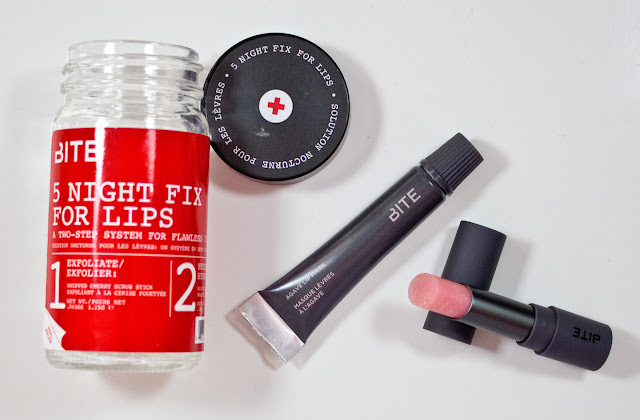 Bite Beauty 5 Night Fix for Lips with Agave Lip Mask and Lip Scrub Stick in Whipped Cherry ingredients. The Agave Lip Mask is a creamy texture balm, that leaves a thin film on the lips. It has a sweat non artificial taste that is pleasant and not distracting. The finish is dewy on the lips rather than glossy but not as matte as a stick balm. I definitely maintain the moister level of my lips and I notice that when i didn't use it the night before although not a dry and I did not developed skin flakes my lips didn't feel as supple. The Scrub Stick in Whipped Cherry is a wax base sugar scrub with a natural cherry scent. I don't recommend eating it though as it is pure wax but if your lick your lips you get the faint taste of sweet cheery. This is the closest feeling to Tarte's old fRXtion Sugar Exfoliator & Lip Balm which I loved, but of course it's only the exfoliate side and not the balm in this product. The formula is on the soft side so that it won't tear at the skin but you won't see instant results but gradual one over 5 days (yes here is that 5 day claim). 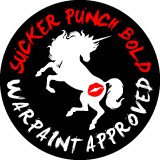 That said you don't want to be too harsh with the skin of you lips either. Together this is a perfect duo because the Scrub work with the top dead layer of skin to keep them smooth while the Mask work to skin into our skin to keep it hydrated. Packaging: These are minis of the Agave Lip Mask at 0.18 oz of product and Scrub Stick in Whipped Cherry at 0.041 oz. Agave Lip Mask come in a foiled squeeze tube. Simple bullet packing with a rubberized grey body for the lip scrub. It a much nicer way to work with the Whipped Cherry lip scrub compared to the pot version. I'm buying a full size once I get through these! I've been looking for good natural lip treatments since Tarte discontinued there lips scrub stick. 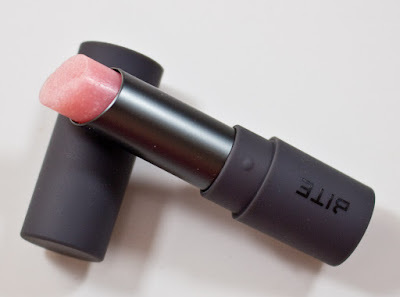 Now if Bite would sell the Lip Scrub pot in the Scrub Stick format at full size that would be great!